Adrienne Wilkerson is an award-winning branding expert and social media marketer. She founded Beacon Publishing and Design in 2001, and joined forces with partner Jennifer Christensen in 2012 to form Beacon Media + Marketing. Beacon specializes in “inbound marketing,” which utilizes social and other digital media to earn potential customers’ trust and bring them in the door without traditional broadcast or print advertising, or in addition to traditional advertising. One of Adrienne’s passions is teaching people how to create digital content that wins people over. If you want to know what to post on Facebook that will keep your customers coming back and even turn strangers into new customers, then don’t miss Adrienne’s session! Bill Popp, President & CEO Anchorage Economic Development Corporation Boom or Bust? Where Are We Heading, Now? 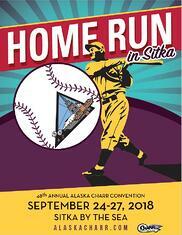 I am sure Thomas will have some great stories, lots of new lessons learned, and pictures of the beautiful city of Sitka. If you are interested in learning more too, please click on the button below.